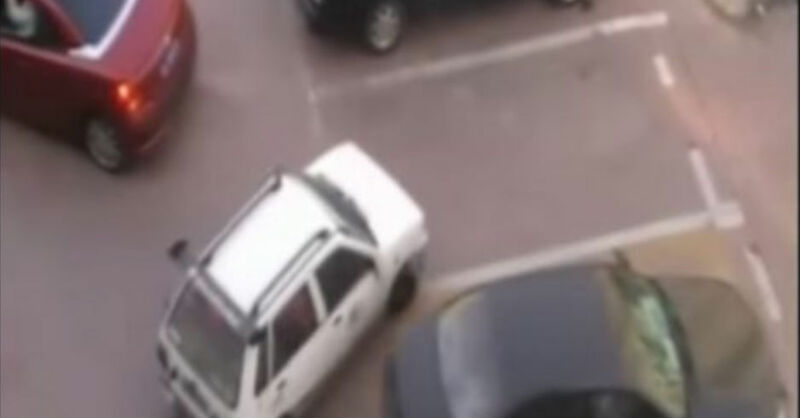 A woman attempting to park her vehicle watched in shock as a man quickly squeezed into her spot, which resulted in the woman taking revenge by using a good portion of the remaining space to effectively keep the man from getting out of his vehicle. Video of the encounter, which lasts under 90 seconds and apparently took place in Asia, shows the woman in a red vehicle getting ready to back up into the parking space. However, in the interim, a man in a white Suzuki manages to move in and park. However, since both vehicles are small and the man parked closely to the car on his right, there's enough room for the woman to carefully maneuver her car into the space. It ends up trapping the man in his car, while the woman presses a button that shows that her vehicle can be transformed into a convertible. The roof slowly slides back into the trunk of the car, and the woman is able to climb out and leave for her destination by stepping on the back seat, followed by the trunk and then the parking lot itself. There's some question whether this video that was first posted online in April 2010 was staged for the humorous aspect involved. That's because the video wasn't a standard security tape, but two men simply filming it from above, which does raise some suspicion, considering the mundane nature of parking lots. To have simply discovered it by happenstance seems open to question.